What better way to make your home more beautiful than using a vase as a centre piece in your drawing room? Nilkamal offers you the Mosaic Cluster Broad Mouth Vase in Sea Green to amplify the beauty of your simple, elegant coffee table. The Mosaic Cluster Broad Mouth Vase in Sea Green measures 17.5 cm in width, 17.5 cm in depth and 33 cm in height. The vase is made entirely from glass. Top quality glass has been used to make this beautiful mosaic vase. The mouth of the vase is quite broad, while the bottom of the base is broad enough to support the weight of the vase as well as any flowers placed in it. Also, the vase has a beautiful barrel shape. 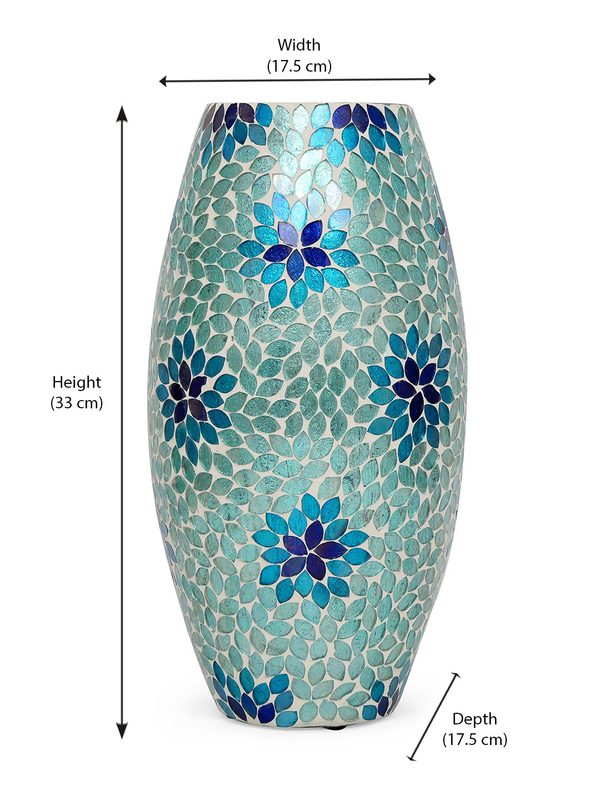 The package contains one Mosaic Cluster Broad Mouth Vase, Sea Green. The mosaic cluster pattern of the vase is in the form of splendid floral designs that are in multiple shades of blue and sea green. The Mosaic Cluster Broad Mouth Vase, Sea Green can be used a centre piece that is kept on the coffee table, or as corner piece placed on the side table or as knick knack in the book shelves or the wall display units. Buy the Mosaic Cluster Broad Mouth Vase, Sea Green @home.